Porters Creek trail is a great trail to hike anytime of the year especially in the winter months when snow makes other trails a tad too difficult. However, in the spring and summer months the vegetation is a thing of beauty making for the perfect scenic trail for a leisure hike. Rest up for the hike back, and snap some photos. Hiking Porters Creek: A gravel road will take you the first mile of your hike on the Porters Creek trail and lead you into a forest of trees and rocks engulfed with moss. 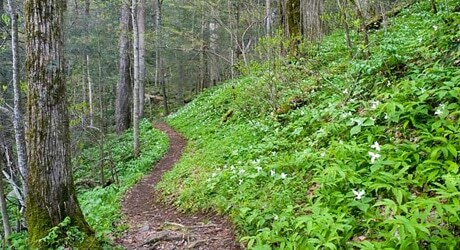 It is recommended to hike this trail in the springtime as an abundance of yellow trilliums near the trailhead will be starting their blooming period. Toward the end of that first mile, you will see the remaining stone walls of the old farmstead of Elbert Cantrell, Vander Bill Whaley as well as the Ownby Cemetery. These features date back to the beginning of the 20th century. Once you cross the footbridge, you will come across a fork in the road. If you go right, after about 250 yards, you will hit the old John Messer farm site featuring a barn that was built by John Whaley in 1875. There is also the Smoky Mountain Hiking Club’s cabin that members used as an overnight shelter until 1981. If you choose to go left at the fork and head towards the waterfalls, be sure to bear left after about 100 yards at the next junction to continue onto Porters Creek trail. The road you are on should, by this time, turn into a path and you will start to see much larger and older trees. 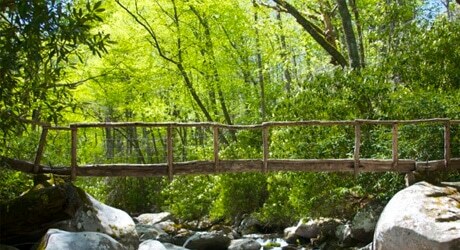 Pass the upcoming footbridge and look at all the beautiful wildflowers. The forest floor is home to an array of wildflowers such as bloodroot, hepaticas, white fringed phacelia, violets, white trilliums and more. The 60-foot Fern Branch Falls drop off towards the left of the Porters Creek trail as you reach the end of your hike. This is where you will want to rest up for the hike back, and snap some photos. Starting at light #3 in Gatlinburg or the junction of 441 and 321, turn to travel eastbound on 321. Next, drive 6 miles and make a right into Greenbrier looking for a sign marked Great Smoky Mountains National Park entrance. That road will then turn into a gravel road where you will drive 3.1 miles before hitting a fork in the road. Continue heading straight at the junction to reach the Porters Creek trailhead. The parking lot will be about a mile up from the fork.